Batter up! Click here to play! You had a successful college career, but now you're in the big leagues, and it's time to prove you're worth your salt. The Gameton Players may be one of the worst teams in the league, sure, but they have heart and enough backing to finally afford a decent player. You are that decent player, and you're going to have to get the rest of your team up to your standard if you ever want a chance at the really big money. Right now, your team makes most of its money selling popcorn, fries and hot dogs while training than it does from sponsorship deals. You'd think it would be the coach's job to ensure his team was up to scratch, but the coach is... well, he's not all that good anymore. He used to be phenomenal back in the day, which is why the manager of the Gameton Players hired him. At 93, though, he mostly just forgets that practice is on, and half the time he's there he starts talking about cricket instead of baseball. Long story short: you need to take your team to the top by turning the batters into home run machines and the pitchers into strike throwing monsters! The coach won't be able to, that's for sure. ...That sounds pretty hard, actually. Lucky for you, this is really just a baseball themed slots game that you can play from home for a big payday. All that training and coaching doesn't sound fun at all. 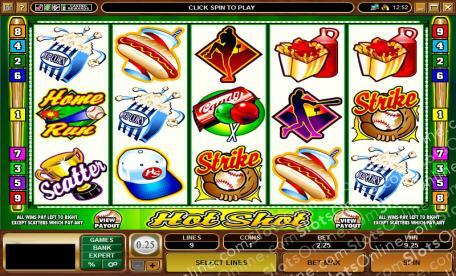 I'd just play to win the big Hot Shot slots jackpot if I were you, to get the baseball flavor without all the work. The Trophy symbol is the scatter symbol in this game, and it pays out on the total bet when 3 or more land on the reels. 3 symbols pay 10 times the total bet, 4 symbols pay 50 times the total bet, and 5 symbols pay 100 times the total bet. The Wild Ball symbol can substitute for any symbol other than the scatter symbol in order to make up a winning combination.